This badge certifies completion of the Discovery Exercise and a URL has been submitted as evidence of learning. 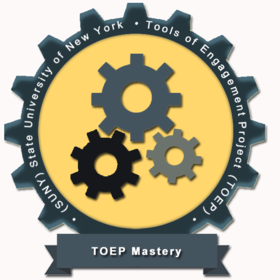 TOEP Mastery Badge to show that you completed the TOEP requirements. Yes, make Tools of Engagement Project (TOEP) a Trusted Issuer. This will automatically accept all pending and future Credit from Tools of Engagement Project (TOEP). By removing trust, badges created by Tools of Engagement Project (TOEP) are no longer automatically accepted and you'll need to review in your inbox before accepting.